Showing 1 to 37 of 37 job(s). COLI/BOLI, FSA. Seeking a new or near FSA to be responsible for the product development process, pricing and in-force management. The person in this position will price new products and Private Placement cases; provide actuarial support for the filing of new products and riders; and support product management. Knowledge of COLI/BOLI, UL/VUL and high net worth products is highly preferred. ALFA and Stochastic Modeling experience is essential. Strong communication and interpersonal skills are required. Northeast Region and Southeast Region. Senior Analytics Opportunity. P&C Actuary with at least 15 years of experience needed to lead a growing analytics group at a well established company. Candidates need strong leadership as well as hands on analytics experience. Multiple locations. Individual Life Pricing Actuary, FSA. Hands-on position focused on pricing and product risk management for Individual Life reinsurance. Will mentor a small team. Some travel. Ideal candidate will have 10+ years of experience. Prior reinsurance experience is preferred, but not required. Northeast Region. FSA, Financial Actuary. Mainly responsible for all the actuarial and modeling support for the pricing, designing, and execution of our capital solution/financial reinsurance deals. 7 years of life insurance. Working experience of financial reinsurance deals highly preferred. Eastern Region. Pricing Manager. ACAS/FCAS with insurance product management and pricing experience for a Product Management role. You will manage homeowners products for your assigned region. You will be responsible for managing 1-3 pricing analysts. Northeastern Region. AVP Life or Annuity Financials: FSA for either role, (2 openings), who is looking to work in a dynamic, entrepreneurial, and collaborative environment. Key products are UL or IUL (Life), or Fixed Indexed or Variable Annuities, but cultural fit is more important. Looking for actuaries who consider themselves self-starters with intellectual curiosity. ALFA and Polysystems a plus. Northeast Region. FSA, Life Valuation. Seeking an actuary to assist with the valuation of variable universal life and responsible for modeling the business on both a statutory and a GAAP basis. 3+ years of managerial, supervisory experience. Northeast and Southest Regions. Pension Actuary: Successful Pension Plan Administration Firm looking for a Pension Actuary for a potential succession opportunity. EA a plus but not required. Great work environment and benefits. Eastern Region. Pricing Actuary, ASA/FSA. As a member of the pricing team, you will be expected to manage the reinsurance pricing process. Duties to include assisting in the design and build out of AXIS pricing models, provide strong technical expertise in the development of pricing assumptions, participate in the development of product strategies and pricing bases for entry to new markets/new products, and support the business development of external customers and internal stakeholders. AXIS experience is highly preferred. Northeast Region and Southeast Region. Retirement Actuary. My client is seeking an accomplished FSA, ASA or EA with pricing experience to join the Pension Buyout team to support pricing, analysis and underwriting of possible cases, proposals/RFP’s, product development and contract reviews. Effective collaboration and communication is needed to support maintaining relationships with intermediaries and working with internal operations and corporate functions. Knowledge of pension risk-transfer is highly desired. Northeast Region. AVP, Economic Capital Modeling. Global insurance company is looking for an ACAS or FCAS with 4-9 years of capital modeling. Candidates need experience with capital modeling software such as Igloo, Remetrica or other similar software. Eastern Region. Manager, Life Actuary. Top consulting firm seeks an FSA or near-FSA to work on a variety of projects including statutory and GAAP reporting, mergers and acquisitions, embedded value, and financial projections. Ideal candidate will have 6+ years of actuarial work experience; preferably in a consulting environment. Some travel required. Eastern, Northeast and Midwest Regions. Predictive Modeling Lead. Our client, a growing financial services company, is seeking an experienced predictive modeling/actuarial lead to help grow their analytics group. Deep P&C knowledge of modeling and pricing is needed (8+ years). Must have excellent communication skills, and be able to convey technical information to non-technical audiences. Multiple Locations. Life Consultant, ASA or FSA. Seeking someone with 5-12 years of experience in either LTC, Life valuation, PBR, M&A, AXIS and/or Prophet. The candidate will be expected to contribute to a broad range of client projects and assist in business development. The incumbent will achieve significant interaction and visibility with insurance companies, reinsurance companies, investment banks, law firms, and regulators. Consulting experience is ideal, not required. Travel is approximately 30%. Multiple locations. Specialty Lines Actuary. Our client is looking for an ACAS to join their specialty lines team with preferably 4+ years of experience as well as experience managing multiple employees. Must have advanced skills in Microsoft Office (particularly Excel), and programming experience in SQL and VBA. Northeast Region. Health Actuary, Pre-ASA. Will support the analysis and data needs for a broad range of financial and actuarial functions. This support will include rate reviews, financial planning and projections, trend analysis, product development, provider reimbursement analysis, provider risk analysis, and medical cost containment analysis. Must have prior experience working in Commercial, Medicare or Medicaid. Northeast Region. 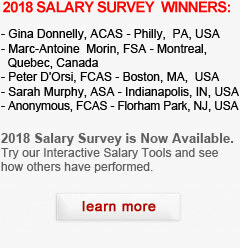 Salary: $65,000 – $90,000 plus bonus. Actuary - Retirement, ASA, EA. Will provide pension consulting, administration, and related actuarial services to clients of all sizes. Seeking 5-10 years of experience, specifically Pension Plan Valuation experience. New/near ASA and a new/near EA is highly preferred. Southeast or Northeast Region. Salary: $80,000 - $130,000 plus bonus. Actuarial Software Developers, Telecommuting Opportunity. Seeking FSA’s with hands-on experience in developing complex software in C++ and significant experience with actuarial modeling systems. Position will entail designing and implementing new features for AXIS and solving actuarial issues. Candidates must be self-motivated, have strong communication skills and enjoy both learning and teaching. Experience in Microsoft Developer Studio, object-oriented programming and knowledge of insurance principles, products and markets is strongly preferred. Previous experience with AXIS is an asset, but is not required. Multiple Regions. Salary: $100,000 - $130,000 plus bonus.